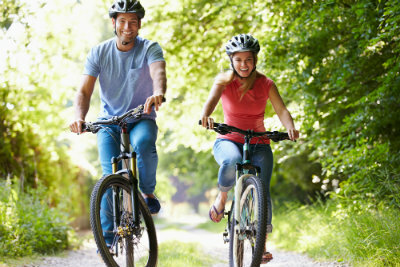 Cycling takes the second spot as the most popular outdoor activity in the United States. It’s an activity that anyone can participate in, it has been shown to lower the risk of breast cancer in women, and countries with the most cycling and walking have the lowest obesity rates. Are there risks to my feet while cycling? Despite the many advantages and benefits of getting on two wheels, there can be some dangers if you are not informed and careful. One injury that can creep up on you is toe pain. Whether it is mild or severe, toe pain while cycling can make each turn of the pedal a task and cut your ride short. Drs. Joel Brook and David Northcutt are foot specialists who often treat foot pain and injuries in athletes. A complaint they hear from cycling patients involves experiencing hot feet or a burning pain in the ball of their foot up into their toes. This toe pain comes from the demand on feet while cycling. Nerves between the metatarsal bones can be squeezed resulting in radiating pain and burning sensations. What can cause toe pain while cycling? Shoes that are too tight – Feet can swell during the course of a ride causing pressure on your toes. Pedals that are too small can also concentrate stress on your toes and the ball of your foot. If you have toe or foot pain while riding, we can help! Come in for an evaluation at one of our podiatric offices. We can treat the pain you have and provide tips to prevent pain in the future. Call us today in Dallas, TX (972) 566-7474 or Plano, TX (972) 943-3323.